The word “innovative” gets thrown around a lot these days, but I feel that it’s the most appropriate word to describe the Split Earbuds from Greenwing Audio. This 3-person startup company from Miami Beach, Florida has come up with a completely new and original way to listen to music. Let me explain what makes their idea so different from other earbud headphones on the market. If you’re like most people, you probably use your iPhone or Android smartphone for listening to music. The phone is a player, which stores the audio tracks digitally and converts them to an analog signal. That signal becomes a sound wave by means of a speaker driver, such as those found in a pair of speakers, or a tiny version inside a pair of headphones. 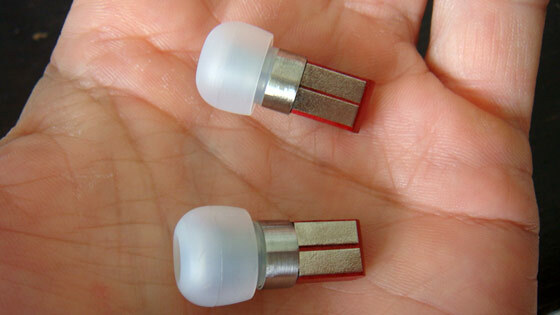 The Split Earbuds combine the player and the earbuds into one device. You don’t plug them in to anything. You don’t pair them wirelessly with your phone. The earbuds ARE the player!